The DUNLOP T84 tyre (also manufactured as SAVA B17 brand) is designed to give maximum traction on rotovators, ride on lawn mowers, garden tractors and other plant equipment. Please note this tyre is marked with size 5.0-10 and is wider than other tyres marked 5.00-10. 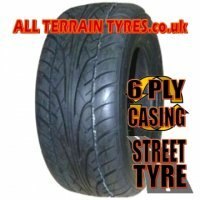 This tyre is also suitable for off-road minis, mini trucks or any machine running on standard 10" rims if you want unbeatable grip! We have wheels in stock too, give us a call.